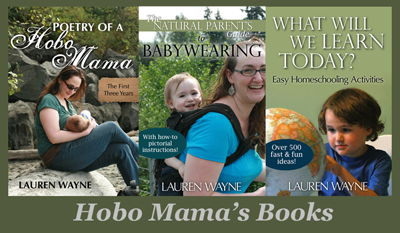 Hobo Mama: LAST CHANCE for the Essential Parenting Collection: Price reduced! Remember, also included is my own book, The Natural Parent's Guide to Babywearing. Do you want to expand your babywearing repertoire? Learn some new ties, brave some new carriers? This book is like a friendly babywearing class, giving an introductory overview of babywearing, along with troubleshooting ideas for special circumstances. We'll talk about the benefits of babywearing, types of common carriers, how to babywear safely, pictorial how-tos for how to tie and wrap the most popular carriers, tutorials for making your own carrier, and a list of helpful resources for information and support on your babywearing journey. It would make an ideal gift for a first-time parent, or for someone new to babywearing who wants to start! The Natural Parent's Guide to Babywearing is part of the Parenting the Early Years Module. If you bought just the six titles from my mini-reviews separately, it would run you $137.96. If you bought the full collection piecemeal, it would cost you $750! Contrast that with $32 (through SATURDAY only!) for the full Essential Parenting Collection. The full collection includes eCourses, eBooks, eAudiobooks, eWorkshops, online yoga courses, and more. With purchase of the full collection, you get exciting extras, like coloring pages from natural parenting artists, an earth-loving activity book, a print copy of Man and Woman and Child, and resources on compassionate communication and encouraging self-esteem. Hurry! The sale ENDS SATURDAY NIGHT, April 26 — and these resources will never again be sold together at this price! Disclosure: Mindful Nurturing links are affiliate links.